INDUSTRY.co.id - Solo, Asia Pulp & Paper (APP), which is part of Sinarmas received a Special Award for the Early Application of GRI Standards at the Sustainability Reporting Awards (SRA) in Solo, Indonesia. This is the fifth award APP received from the SRA and is an appreciation of APP as one of the first companies in Indonesia to apply the GRI Standard for sustainability reporting. The GRI standard was launched in early 2017 by the Global Reporting Initiative (GRI), a global independent organization working on standardization of sustainability reporting, to replace the previous version of the G4 Guide. The GRI recommends early adoption of the latest version of the GRI Standard, which will be officially effective as of 1 July 2018. APP welcomes the recommendation and has applied this latest standard in preparing its Sustainability Report for 2016. 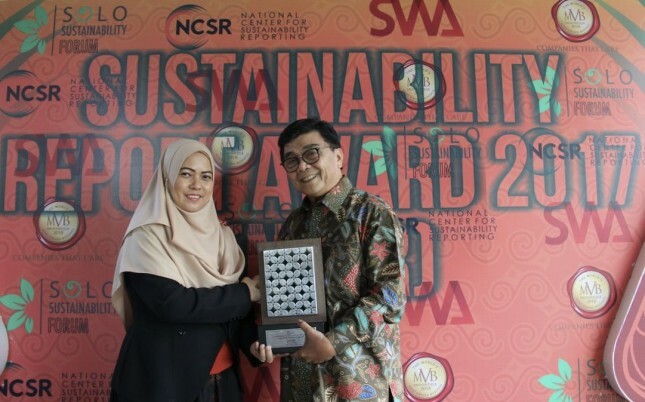 "We are encouraged by this year's special award of the Sustainability Reporting Awards for the implementation of the GRI Standard in the preparation of our latest Sustainability Report," said APP Sera Noviany Sustainability Manager through a written statement received in Jakarta (25/2/2018). He added that our move to implement the GRI Standard early reflects APP's commitment to running a sustainable pulp and paper business, based on the highest standards of accountability and transparency. In its 2016 Sustainability Report released last year, APP outlines its achievements in meeting corporate commitments, including Forest Conservation Policy and the Vulnerability Sustainability Roadmap 2020. In 2016 to be the first year APP implemented a sustainable revision of the KPI's sustainability approach at its plant, which contributes to better energy use and carbon intensity. In the same year, APP has also finalized the Integrated Sustainable Forest Management Plan (ISFMPs) applicable to all APP pulpwood suppliers. "With the presence of a single language applicable at a global level such as the GRI Standard, companies and other stakeholders can now discuss achievements that have been achieved, as well as further, measurable, and more productive measures," Noviany said. "We will be very happy to share our experience in implementing this global standard and we hope that this standard can be adopted more widely in Indonesia in the near future," he said. He added that awards such as SRA provide an important forum for industry players to meet and discuss important topics. Pioneered by the National Center for Sustainability Reporting, the SRA awards give appreciation to companies that communicate their sustainability initiatives and developments through mechanisms such as Sustainability Report and company website. Prior to that, APP won the Special Award for Best Practices at the SRA in 2016 on its Forest Conservation Policy.